Like Celeste of the Women’s Century Club, here in Seattle, I also love your Pope and your Paris. While the German Pope is relentlessly strict in his orthodoxy, it is claimed that he writes a good dogma. And this Pope is a little less forbidding under the City of Lights, although his walking guards throw some shadow on that. They seem to be worrying like stooges working their way through purgatory. But that can’t be helped, for the world is not so perfect as the Popemobile. And the Pope certainly looks fit in his Popemobile. 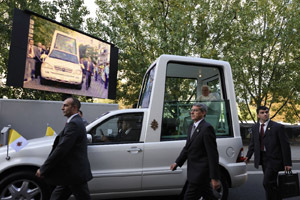 With the fold-out curbside video screen in your photograph one can see the Pope coming and going — omnipresent. How many of these devices did they use in the 5th Arrondissement alone? It may help us wonder what compensating attractions they used in medieval processions, not having these curbside Deus Ex Machines? And it occurs to me that anytime the Pope does a mass in an outdoor stadium they may be useful – fourteen of them – as Stations of the Cross. Whether ex cathedra or inside the cathedra, I think what distinguishes any Pope from the rest of us is something more clinging. They dress the best. How long do you suppose the Vatican has been filling its pope closets with the nonesuch of outfits made from surpassing fabrics by the ruling class of seamstresses and tailors? For centuries. Take off any Pope’s clothes and there is probably not much to prefer. But without the evidence of a Pope with no clothes who can know? Writing now about myself only, as humble as my wardrobe is, every part of it is clean, machine washable and stamped with a free pass to paradise, which I’ll use only if I cannot make it back to Paris.